Calendar Day View: In Daily Appointments to create an appointment for the selected day. Calendar Week View: Near the particular day. Calendar Month View: Near the particular day. 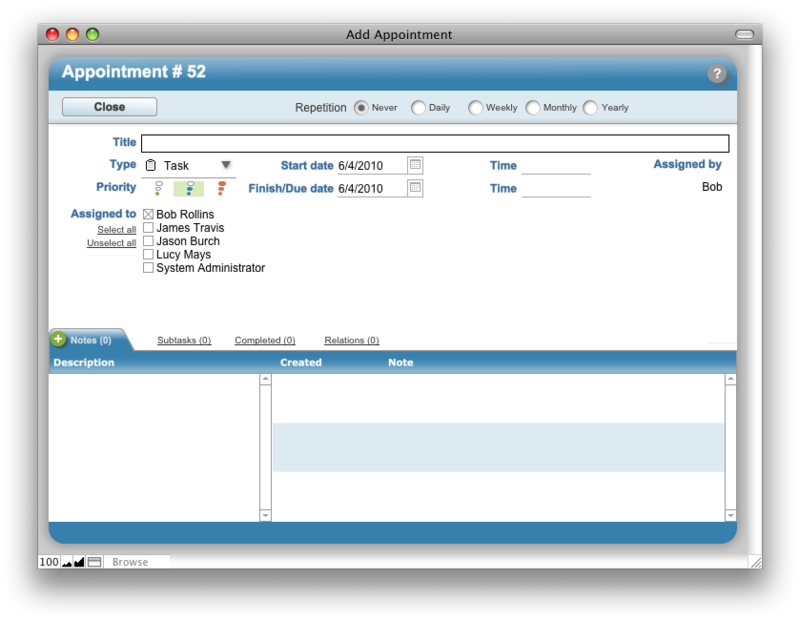 Dashboard: In Daily Appointments to create an appointment for today. Contacts Detail View, Mail Detail View, Mail List View, Files Detail View, Orders Detail View, Invoices Detail View and Products Detail View: In the Calendar tab in the Linked Items Area to create a linked appointment. The Title field is visible in all views. The Type field is shown before the title as an icon. Different icons are used to represent each appointment type. Start date, Finish/Due date, Start time, and Finish time can be defined and are visible in all views. Select Assigned to users for the appointment. Use the Repetition feature to specify the frequency at which the appointment should recur. Specify Priority. The default priority is Medium.